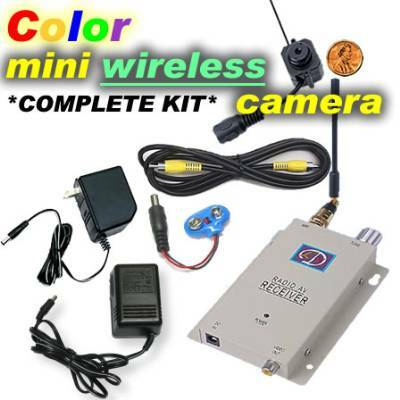 Wireless Pinhole Spy Camera CCTV Newest Mode, High Sensitivity Wireless Pinhole Full-Color Camera with Receiver ! compact design, easy protable, Pinhole design, hide it anywhere! Great surveillance device. * Wireless Pinhole spy camera, with 4 LEDs. * The built in transmitter has a range of up to 100m(dependent on obstacles), optimal distance is 20-50 meters. * High resolution of 380 lines from its CMOS imaging chip set,provide high quality images. * Infrad red function up to 2 meters. The camera has focus which enables you to get the best of pictures. Infrared function provide good pictures day and night, automatically switch from full colour to Infra Red depending upon the light conditions. Wirelessly transmitt the picture and sound to TV or computer, and can login from anywhere with an internet connection to check on whats going on, including Cell phone or PDA enable view the current situation while you are outside. Come with a 9v battery and adapter, choose any power supply mode according to your convenience! 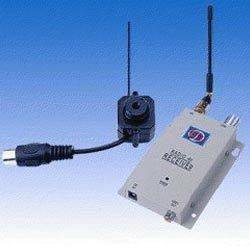 Simply place the camera at the location you wish to observe and plug the re ceiver in to a monitor, VCR or TV. It only takes few minutes to set up. Waterproof, can be used outside! 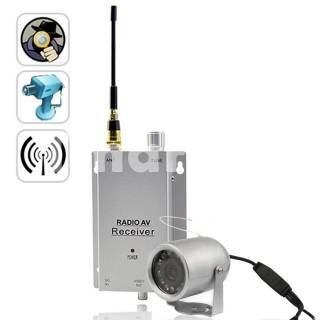 Widely use in offices, supermarkets and warehouses for keeping an on eye on houses, cars and factories etc.